After plugging a hole in the Times of India front page last year for the launch of the Polo (which incidentally reminded me more of the mint), we see yet another expensive print media innovation from Volkswagen. 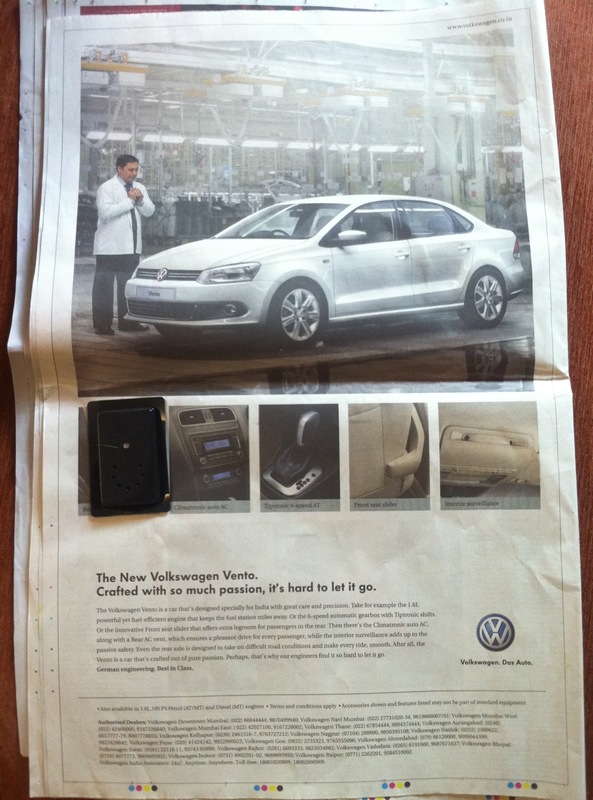 Today’s ToI has a special supplement with the Volkswagen Vento ad on the last page. This ad contains a small speaker with a sensor that plays a voiceover only when you open up the folded newspaper. While I laud Volkswagen for being bold enough to experiment with innovations time and again, I wonder whether this mega expensive exercise was the right way to go about for the launch. Don’t get me wrong. It made me notice the ad and I’m blogging about it. But what I am getting at is the issue of relevance – whether Volkswagen was the right fit for this innovation. In my opinion, the perfect candidate for this print innovation at this time would be KBC 4. On the launch date, they could take out a full page ad with the famous theme music playing when the consumer opens the newspaper! The fault in this case lies with the agency. In their quest to generate maximum ‘award-worthy’ work, agencies often end up shortchanging the client by preferring gimmicks over effectiveness. I am proud to say that in my four years at agencies, my team can never be accused of the above.